Life has been getting in the way of writing again, but that doesn’t mean I haven’t been cooking. I kept looking at Felicity Cloake’s New Year article (yes, I’m way behind…) in which she suggested that instead of going on bonkers diets and depriving ourselves of many important food groups, we should just focus on eating a bit more mindfully. I totally agree with her but I was worried that Missy B might turn her nose up at a pale poached chicken on a bed of grains, with a side order of green sauce. How wrong I was. 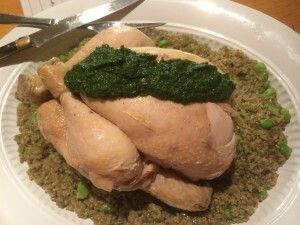 She declared that she LOVED the poached chicken, “much nicer than roast”, and accepted the freekeh and cavalo nero purée with good grace. The picture in Felicity’s article looks way better than mine – but rest assured, this is a lovely way to cook a chicken and henceforth it will always be known as Freaky Chicken at Battenburg Towers. Re-reading Felicity’s article also reminded me that I recently made her disco-slaw – I’m not sure why she calls it that, but it was fabulous. I love brussels sprouts and it’s always great to find a new way of serving them. 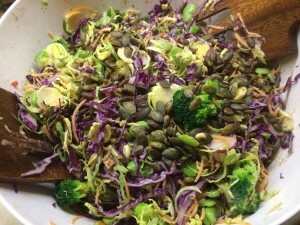 In this case, raw with lots of healthy vegetables (broccoli, broad beans, red cabbage, carrots, radishes to be precise), toasted seeds and a totally fabulous peanut butter based dressing. And here’s another almost out of season salad: I do try to keep my cooking mostly seasonal but I sometimes succumb to the temptations offered by online shopping. Mix the mustard and honey in a bowl. Whisk in the rapeseed oil then the olive oil gradually so it emulsifies and thickens. Add cider vinegar to taste. Cut the onion in half, then slice into half rings. Slice the garlic and chop the thyme. Place these ingredients in a heavy based pan with the sugar, wine vinegar and a pinch of salt. Cook over a medium heat until it all gets sticky and caramelised. Set aside. Slice the jerusalem artichokes lengthways into halves or quarters, depending on the size, and roast in a hot oven (I did 200°C/400°F/gas mark 6) with a drizzle of oil and a sprinkling of salt until they are softening and colouring on the congress – around 15 to 18 minutes. Remove from the oven and grate over the lemon zest. Toss together with the parsley. Toast the seeds in a dry roasting tray in a hot oven for about 6 minutes, shaking once or twice during cooking. I actually dry fried the seeds – keep an eye on them if you’re doing this. If you turn your back, they’ll burn. 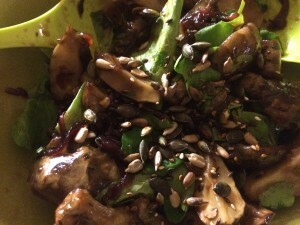 Toss the onions, jerusalem artichokes and seed together with a couple of spoonfuls of the dressing. Gently fold in the watercress leaves. Check seasoning and serve. The artichokes are coming the end of their season, but I did spot some in Borough Market yesterday – so there’s still time to try out this recipe! !